I got my first official Ipsy bag. It came wrapped in a gorgeous metallic pink bag. I did not save the packaging. I knew it was my Ipsy bag right away. The theme for this month is Pretty in Paradise. 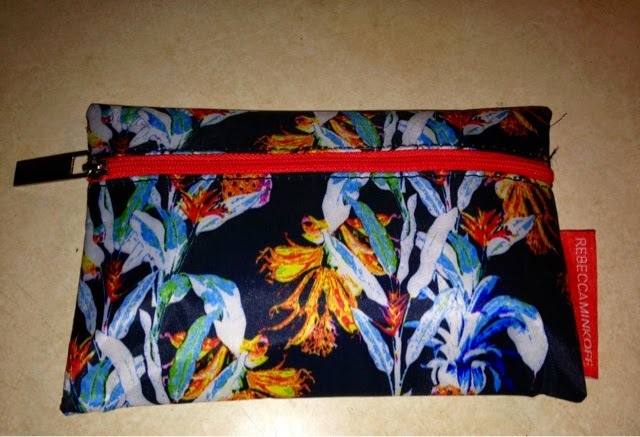 The bag was designed by Rebecca Minkoff for Ipsy. I have heard of Rebecca Minkoff but I have never bought anything from her. The bag was one of my favorite things about my Ipsy this month. I think it is great for summer and I will defiantly be reusing this bag. One of the first items I saw was a NYX butter gloss. It is in Eclair. I am super excited about this product because I have heard so much about NYX and their butter glosses. This shade is a really light and beautiful shade of pink. It smells super good as well. It smells very sweet like a yummy dessert. It also moisturizers my lips. The next thing I saw was a real tree for her perfume sample. I haven't worn it out yet but I did spray it. Does a very floral smell and is a strong perfume. I really like it. I know some people said that it was too strong for them. I haven't tried wearing it out all day so I don't know how long the scent lasts. The full size is $20 dollars which I think is very reasonable for a perfume. I got a shimmer eyeliner from Nicka K New York in Blue. I think this is a beautiful shimmer color. I am very pleased I got this eyeliner in blue. I haven't worn it out yet but I've heard it is long lasting. Some people say it almost lasts too well and is hard to take off. I will try to post a review once I wear this if anyone is interested. Two products I was not super happy about getting was the Carol's Daughter Sacred Tiare styling cream. First of all my hair is very thin and it is labeled to help combat frizz. Second of all I never blowdry my hair I only let it air dry. Plus, this tube is really small and I would probably have to use the whole tube or at least more then half to cover my hair. The second item was the Ofra Eyebrow pencil in brown. It says it is universal but when is swatched it, it looks like a light brown. I have light brown hair but my eyebrows are almost black. So this is not really a universal color. Plus, I very seldom if at all wear anything on my eyebrows. Overall, I did like the bag. I think getting three out of five products I will use and like makes the bag worth it. Plus the bag itself from Rebecca Minkoff is gorgeous. In the future I hope I get more products I can actually use. This bag was still worth paying $10 Dollars and getting some great new products. Three out of five is good! And i actually like the products you receive. 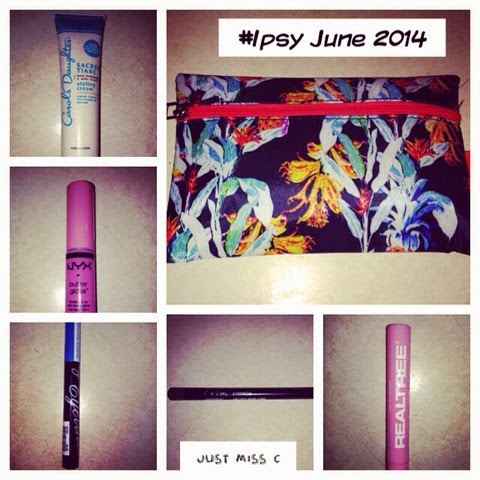 Besides the pouch and the lip butter, this month's bag was a let down for me ;( Have you tried Vain Pursuits though? Bc i'd love to have your thoughts on their skincare line! 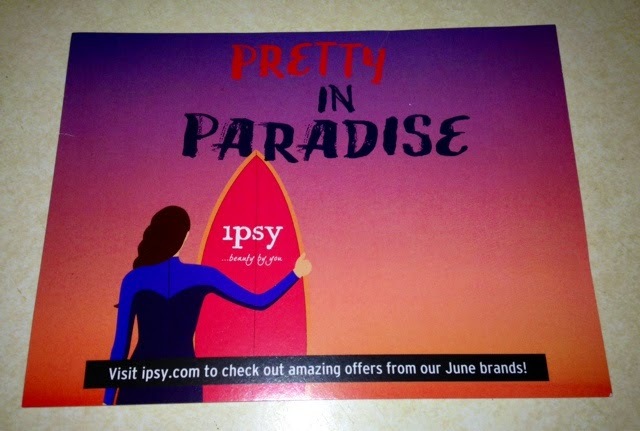 I wasn't super excited about the June Ipsy. It was my first one. Since I posted this I use the lip butter pretty much everyday. I got the eclair color and I love wearing it by itself or topping it over my lipstick. I did end up using the eyebrow pencil. Surprise Surprise! I like it but it goes down really fast and looks gummy if you don't take it off right away. I really liked the glitter eyeliner but have barely used it. I thought I would use it much more then I have. Still haven't opened the hair stuff. I really need to trade that or give it away. I have never heard of vain pursuits so I can't really say anything about their products. I will have to look them up.